Belated lesson from Weeks 3 and 4: Sports, sports, sports! Almost everything I’ve shot for The Missourian in the past two and a half weeks has been sports. Hickman High School football practice, the day before playing against Wentzville. Junior wide receiver Anthony Oetting, left, dislocated his hip last season but is returning to play for the Kewpies as a starter. Since I shot the Sept. 5 football game pitting Illinois against MU, I’ve shot a high school soccer game, MU volleyball practice, high school football practice and private gymnastics training. The only non-sports assignments I’ve had are a three-day field reporting trip for agriculture journalism professor Bill Allen’s class (not affiliated with The Missourian) and a fairly odd portrait assignment I completed yesterday. Hickman High School junior forward Connor Hollrah drives the ball past Jefferson City High School senior midfielder Gavin Juckette on Sept. 8 at the Soccer Park in Jefferson City. It’s as if something or someone told the editors that I want to practice more sports shooting. I’ve had a lot of experience shooting basketball, and I’m pretty comfortable with baseball, gymnastics and swimming. But fall sports — like everything I’ve shot in these few weeks — are not my strength. And that includes not just shooting to get the moment or the game shot but also shooting for features. MU freshman middle blocker Lindsey Petrick watches for the ball during practice at the Hearnes Center on Sept. 15, the day before the "Dig for the Cure"match. Petrick's grandmother is a breast cancer survivor. Anthony Oetting. Again. High school football is so epic, and I mean that seriously. Shooting soccer with just a 400mm lens is pretty tough. Long story short, I’d brought my Canon body and 70-200 but forgot the battery, so I was stuck with a Nikon D2Hs and a 400mm lens. Told to focus on a particular forward player, I stationed myself at the other end of the field and rotated between a few positions at that end. Unfortunately, this meant that once the players crossed midfield, I could no longer fit them in my frame. Then, unpredictably and inexplicably, the lens started going out of focus. After a lot of fiddling around with the settings, I found the only way to get it to autofocus again was to set it to manual, manually focus the lens again, set it back to auto and fire until it started going out of focus again. Nightmare? Rather. Shooting volleyball is pretty tough. Especially in the Hearnes Center, where the light system is murder for any photographer whose camera starts croaking above ISO 1000. Especially if you’re trying to get clean shots with clean backgrounds. Especially if — no matter how many times you fiddle with your lens’s focal range, your camera’s focus and drive settings and everything else you can think of — your lens keeps backfocusing. I shot 251 frames in 1.5 hours of volleyball practice and walked out with four that I consider publishable. Shooting football practice was a cinch compared to everything else. This is perhaps ironic, as photographing football is not my forte. Shooting gymnastics in a private gym is pretty tough. Really, the worst part was the lights. Each light cast a different temperature, which made white balance an absolute horror. But more on this later — that story hasn’t been published yet, and those photos will come in the next weekly update. My next few assignments will not be as sports-centric. Tomorrow, I’m shooting a dress rehearsal of a play at Stephens College, and this weekend, I’m one of four photographers covering the third annual Roots ‘N’ Blues ‘N’ BBQ Festival. Plus, I’m taking over another photographer’s Friday afternoon shift, and who knows what will happen then? As always, you can view more photos from these shifts. 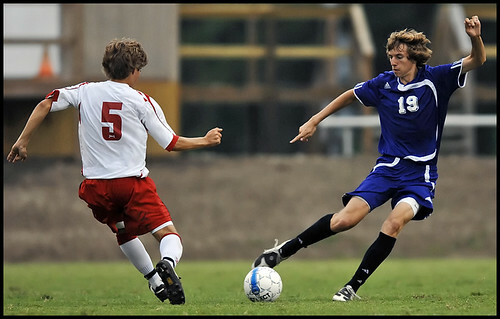 Awesome soccer photo! The players complement each other perfectly, and I love Juckette’s balance finger.